When you arrive, look for our Fellowship Kids Help Desk. 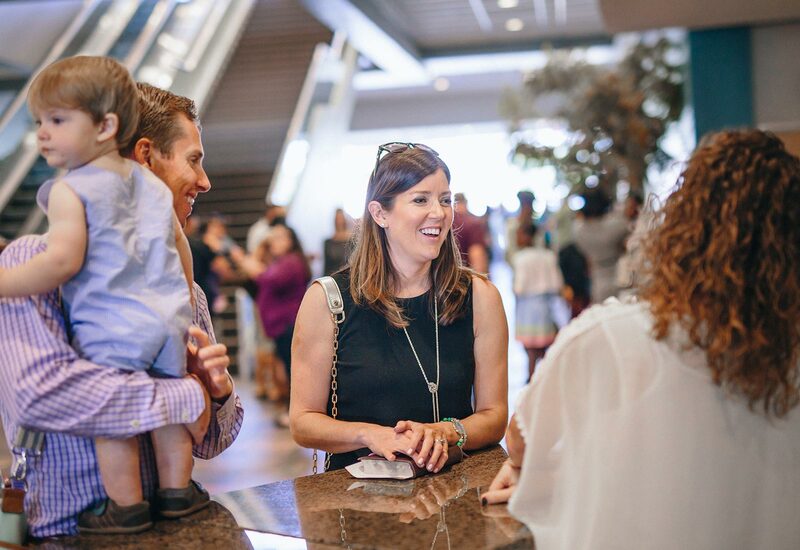 One of our friendly team members will help check your child into our system and show you around Fellowship Kids. At check-in, you and your child will receive personalized, coordinating ID tags unique to your family and your visit, which you will show after the service in order to pick up your child. Check-in is open from 9:15-9:45am and from 10:45-11:15am. In New Creations your child will be introduced to the wonder of God as our loving creator through prayer, praise, and the creation story. Please click here for special information for New Creation parents. The Bible is brought to life in the Ark through engaging storytelling and fun songs followed by small group. Ark Kids will discover the wonder of God’s story as they journey from creation through the life of Jesus. The Treetop combines interactive learning with relationship-building activities that reinforce key Bible stories. Every month a new Life App is presented to help children discover more about God’s character and reflect it to the world around them. In Route 45, your child will dig even deeper into the teachings of Jesus. Through large group teaching and gender-based small groups, Route 45 encourages personal discovery and open discussion as your kids make their faith their own. Your child’s safety is our first priority. From check in to check out, every kids ministry team member has been thoroughly vetted and trained to ensure that your child has a safe and fun experience at Fellowship Kids. Download the safety and emergency procedures below to learn more. Your child’s safety is our first priority. Our desire is for your child to be safe and feel safe, so we surround them with loving staff & volunteers who will interact with them at an age appropriate level. Every child’s name tag is matched to a parent identification number, all volunteers are interviewed and background checked, our rooms are monitored by video surveillance and our leadership is trained In first aid & CPR. We want you and your child to feel at home from your first visit! Kid friendly fun is a part of every worship and group experience through energetic worship, interactive activities, live acting and teaching and relationships with leaders who love them and feel called to share the love of Jesus with kids. When kids have fun at church, they can’t wait to come back! See you again soon! We want the Bible to come alive through teaching, activities and discussion. Ultimately we want children to have a solid foundation in truth that will lead to faith in Jesus Christ, a love for Him and desire to follow Him. We want kids to know that they have a God-given purpose that begins with a relationship with their Heavenly Father and grows as they follow Him and recognize their gifts, strengths and have opportunities to serve Him. We have a strong team of staff and volunteers who will pour into your child each Sunday… but Monday is coming and you as the parent have the most influence in your child’s life and spiritual development. We value partnering together as a team and resourcing you as parents with Truth Foundations, At Home Calendars to engage the stories we are learning, parent gatherings and family events.